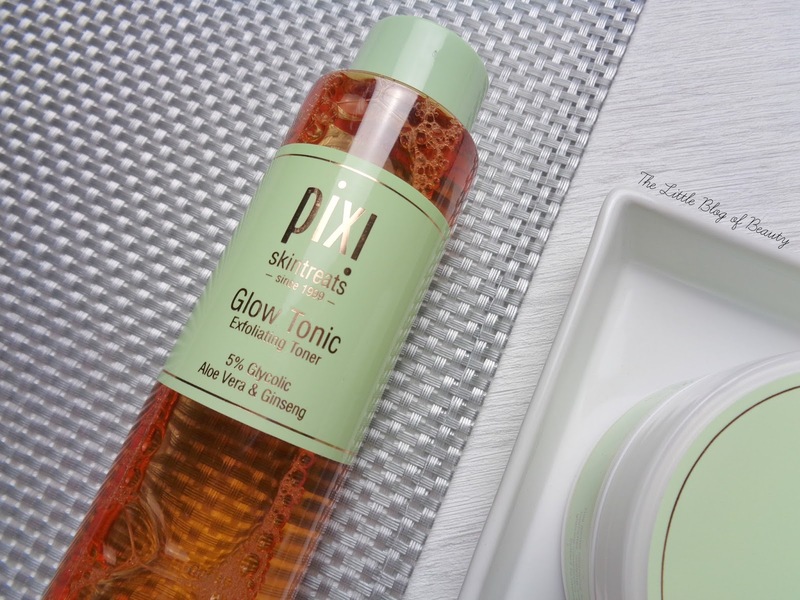 I've been curious to try out Pixi's Glow Tonic for a while now, but until recently it was quite difficult to get hold of. At one point I believe trying to get your hands on a bottle outside of London involved calling the London store and placing an order over the phone. Although it is now much easier to get your hands on you'll often find it out of stock. Pixi is now stocked in M&S stores and I've been keeping an eye on the Pixi stand, but as of yet I've not seen a bottle of Glow Tonic sitting on the shelf. Even the tester I did find on one occasion was completely empty. So when I received an email from HQ Hair asking if I'd like to try out Glow Tonic* and also the Nourishing Cleansing balm*, I gratefully accepted. In the past I've always preferred cleansing oils over balms, but after trying a small sample of the Trilogy Make-up Be Gone cleansing balm I've started to come round to balm cleansers. 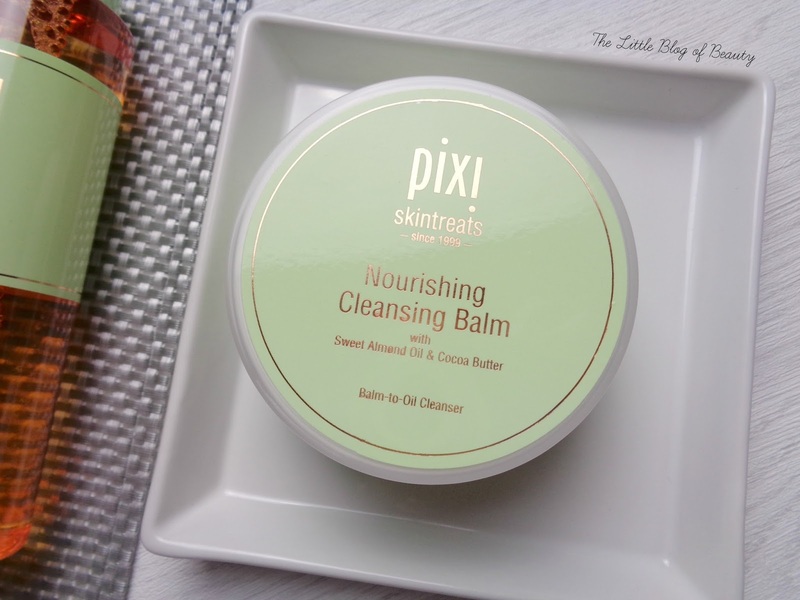 The Pixi Nourishing Cleansing balm contains sweat almond oil, cocoa seed butter, shea butter and vitamin E and this comes in the form of a solid balm in a tub. The balm is pretty neutral in colour, hence why there's no picture to show you this because there wasn't really anything for my camera to focus on. You only need to use a small amount, probably smaller than you think you need to use, and this melts down beautifully to a thick oil. To begin with you can be left with a few little lumps when you melt this between your fingers but these melt down once you start massaging this into your skin. This does remove make-up well, including mascara, but I'm personally not keen on using cleansing balms to remove my eye makeup because I find it difficult to fully remove balm from around my eyes. My favourite way to use this is to apply it to my bare, dry skin and spend a good few minutes massaging it in. I find this really relaxing and a good way to try and wind down at the end of the day. One of the reasons why I've not been keen on using balm cleansers in the past is because I find them quite difficult to remove but when using the Trilogy cleansing balm I found a method of removal that works well for me. I wet my fingers and keep massaging and keep adding more water and massaging until I feel the texture of the balm change. This makes the balm break down or emulsify and it then becomes looser/thinner and this is then much easier to wipe away with a muslin cloth or flannel. Once removed my skin feels gorgeous; soft and moisturised and I then usually don't need to use as much serum/oil/moisturiser afterwards. A big thumbs up from me. I've never really been one for toners in the past. The only one I've used religiously and repurchased several times is Lush's Tea tree toner water as I think this works really well preventing and helping to treat breakouts. Glow Tonic is an acid cleanser containing 5% glycolic acid plus aloe vera, ginseng and witch hazel, but no alcohol. As it is an acid toner you do need to make sure you wear sun protection while using this and for a week after discontinuing use as this can make your skin more sensitive to the sun. This is intended for use on normal to dry, dull skin and it exfoliates, tones, firms and tightens the skin. This has a light herbal type scent that reminds me a little of Caudalie's Beauty Elixir, but whereas I hate the smell of the Beauty Elixir I really quite like the smell of Glow Tonic. To use you just pop some Glow Tonic on a cotton pad and sweep it over your face (and your neck and décolletage if you wish). I was a little nervous trying this at first, as I am with all acid based products as I do have sensitive, reactive skin, but I haven't had a problem at all. I love the way this makes my skin feel and look. It sweeps away any flaky patches I have and although I don't have the largest pores I have noticed that these have tightened up recently on and around my nose. This might not be entirely down to Glow Tonic, as I have started using several different acid products recently, but Glow Tonic has definitely contributed to this. Again I have also been trying out a few acne/scaring targeting skincare products recently, but Glow Tonic has definitely also contributed to how good my scaring currently looks. Which is even more impressive after quite a nasty hormonal breakout a couple of weeks ago. My skin has also had a bit of a glow since using these products and that's quite rare for my skin. I definitely agree with the hype surrounding this product and I would definitely purchase both this and the cleansing balm. 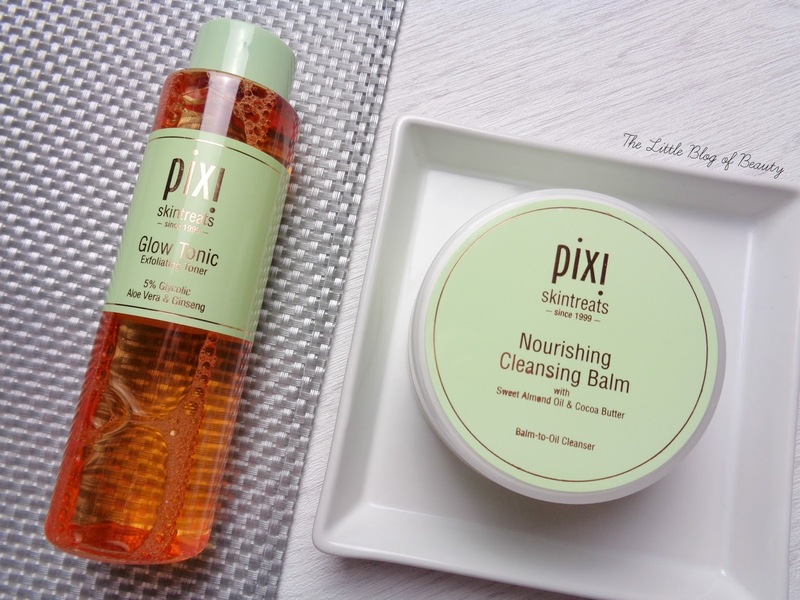 Pixi Glow Tonic and the Nourishing Cleansing balm are both £18 each and can be purchased on the HQ Hair website. HQ Hair do offer free standard delivery on all orders (which will arrive in 2-3 working days) and who doesn't love free delivery?! Have you tried Glow Tonic or the Nourishing Cleansing balm? I'm absolutely dying to try the Glow Tonic, I've read such incredible reviews! I'm using both of these at the moment two and they're fab! I love the cleansing balm. I'm still testing Glow Tonic as my skin hated it at first and I had to let it calm down before I tried it again.